Macy’s is the largest US Department store (by retail sales) in the US. They operate around 840 stores in 45 states, the District of Colombia, Puerto Rico and Guam. As well as the Macy’s brand, they also operate Bloomingdale’s. We really like Macy’s and Bloomingdale’s. Their product line is diverse, well-priced and serviced by quality brands. As a department Store Macy’s sell a huge range of products from home, bed&bath, clothing, handbags and accessories, to jewellery, cosmetics and more. Their “upscale” business is Bloomingdales who retail designer clothing brands such as Ralph Lauren, Burberry, Aqua and others which are not generally available at Macy’s. Macys.com is a generally clean and straightforward shopping site with their extensive product range displayed across the menu at the top. We really liked their product information page (see image on left). It includes product descriptions, photos, customer reviews and Q and A. It also has shipping and returns information listed for each product rather than having it buried somewhere in the dark recesses of the website where only Sherlock Holmes could find it. Bloomingdales.com is similarly laid out as Macy’s with an equally impressive product information page. Bloomindale’s promotes its rewards program “Loyallist” (see below) through almost every product, so you can see which ones are “Loyallist Hot Savings” – though the price is already incorporated. Standard shipping within the US for Macy’s is $9.95. Free shipping kicks in at a rather high $99 minimum order ($50 for beauty products). As always, coupons are available from time to time that provide free shipping with a lower threshold so keep an eye out for those. It is also worth noting that the minimum order requirement doesn’t include tax, gift cards or gift wrapping. Some larger items, such as furniture etc have separate delivery charges. Shipping costs can always be checked on a “per-item” basis as well as at “checkout”. Macy’s and Bloomingdale’s service over 100 countries worldwide in over 50 currencies. Prices are listed in local currency when you change the “tab” at the top of the page, although generally the website will detect where you are and do this for you anyway. Macy’s and Bloomingdale’s have engaged Borderfree to administer their international shipping which are able to provide all-inclusive prices including custom duties. Certain countries enjoy separate and more favourable shipping arrangements. At the time of this review, Canadians could enjoy a CAD$9.99 flat fee for shipping for purchases of CAD$99 or more. Similar special arrangements have been made with shipments to Australia, UK and Russia. Macy’s claim that “returns can be made—for free—at any time after purchase” however there are separate return conditions for a number of products, so it’s important to check those conditions first. Macy’s have recently introduced free return shipping which is a really positive step. Alternatively, goods can be returned to any Macy’s department store for refund or exchange. Note that you cannot purchase something at a store and have it refunded via mail. International returns are also provided with a 180 day maximum – subject to product-specific restrictions where applicable. Macy’s rewards program Star Rewards is attached solely to its branded store credit card. Depending on your expenditure for the year, you will be sent up to 12 Macy Star Pass mailings per year. The Star Passes generally offer generous discounts to specific products. Those who upgrade to a Macys Amex card can get up to 3% cash back (in the form of store credit) for Macys purchases and 1% for purchase made outside Macys. 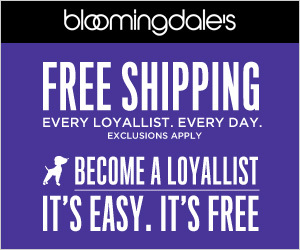 Bloomingdale’s rewards program is known as “Loyallist” and is free to join. 1 point is generally rewarded for each dollar spent with 5000 points entitling you to a $25 reward Gift card. While this represents an effective cash back of a measly 0.5%, there are many opportunities to receive double and triple points during certain promotions and cosmetics and fragrances always deliver double points at any time. Holders of the Bloomingdale’s store credit card can earn 3 points per dollar (6 points for cosmetics and fragrances), delivering a maximum 1.5%-3% cash back which certainly becomes more attractive. However there is a big sting in the tail. 75% of your points will expire EVERY year on December 31st. So if you go crazy on Black Friday and/or Cyber Monday and order big – you’ll need to spend your points within a month or lose 3/4 of them. So while Loyallist membership is only so-so for in store shoppers it is well worth it for those shopping online. Loyalist members will get free shipping without a minimum purchase requirement. This alone makes it a no-brainer. Finally, all those who sign up to receive newsletters will receive a 10% discount on their next order. Be savvy shoppers and use that to your advantage! Although an online visit to Macy’s and Bloomingdale’s does not quite have the same niche in popular culture as a visit to their bricks-and-mortar stores (particularly their flagship store in New York), their solid reputation, great range of merchandise and pricing (despite their shipping costs) make online shopping with them a pleasure. Click below to shop at Macy’s. Click below if you’re from Canada for some great specials for Canadians only. Great place to shop but ive been relucatnt to buy online because of postage costs. Macys need to get with the program and offer free or at least cheap shipping. I always go to Macys when I go to NY to visit my sister. The NYC store is amazing. Good to see that Canadians are finally being catered for! Love Macys. Have never ordered online before but will def check it out. Had lots of problems with macys. Terrible customer service. Never buy from them again. I like this review a lot! Macy’s has pretty NICEwebpage and it’s worth to check it out. Great place to shop. Wow, I’m not sure I would buy online with a free shipping at $99. I’ve never been to a real Macey’s either even though they are only 8 hours away from me. I have a more wild, only black style so I don’t mix well with Macy’s but this is the place I go when I have to shop for clothes to wear around the house or to the gym. My mother is wild about Macy’s; most of her office outfits are from them but you could swear they were much more expensive. The secret is how you style the outfit, a small belt or a statement necklace can do wonders. We go shopping together and before buying something, we think of ways she can style them or if those pieces can be paired with something she already owns. They also have pretty cool home decor products and most of them have decent price tags. Oh my gosh! I absolutely love Macy’s and Bloomingdale’s! And I definitely Free Shipping with the $50 beauty products…a must have for me! And it’s a great way to spend time with my mother when I go back home…Macy’s in NY….always fun!